When measuring mortar or other cementitious materials with ultrasound the question arises whether the results of the non-destructive measurements are coherent with visual parameters describing the hydration process in the material. Special microscopic techniques are difficult to apply due to the interaction between the method (for example evacuation) and the material. First results are presented describing the use of the scanning electron microscopy (SEM) and the nuclear magnetic resonance spectroscopy (NMR spectroscopy) investigating mortar or cement paste and calorimeter measurement of hydration temperatures in comparison to results of ultrasonic measurement techniques developed by the authors. Ultraschall, Raster-Elektronen- Mikroskopie und Kernresonanzspektroskopie  Untersuchung der Hydratation von Zementgebundenen Materialien. Es wurde untersucht, in wie weit das von den Autoren entwickelte Ultraschallverfahren zur Untersuchung von zementgebundenen Materialien durch andere Prüfverfahren verifiziert werden kann. Die vorliegende Arbeit beschreibt dabei die Probleme, die durch die Anwendung der Raster-Elektronen-Mikroskopie (REM) und der Kernresonanzspektroskopie (NMR) auftreten. Diese Probleme sind vorwiegend mit der Evakuierung der Prüfgefäße und der Störung des Hydratationsprozesses verbunden. Erste Ergebnisse beschreiben die Anwendung von REM und NMR bei der Untersuchung des Hydratationsverlaufs in Zementleim und Mörtel. Sie wurden mit den Ergebnissen der Ultraschallanalyse verglichen. Ultrasons, Microscopie Electronique a Balayage et Resonance Magnetique Nucleaire  Etude de L'Hydratation des Matériaux Cimentaires. La vérifiabilité par d'autres méthodes du procédé ultrasonique développé par les auteurs pour l'étude des matériaux cimentaires est examinée. L'article présent décrit les problčmes apparus lors de l'application de la microscopie électronique de balayage (REM) et de la spectroscopie de résonance nucléaire magnétique (NMR). Ces problčmes sont reliés essentiellement ŕ l'évacuation des récipients d'essai et ŕ la perturbation du processus d'hydratation. Les résultats présentés décrivent l'application de REM et NMR aux investigations sur les mortiers et ŕ la pâte de ciment et sont comparés ŕ ceux obtenus par la technique de mesure ultrasonique. As presented earlier [Reinhardt & Grosse 1996; Grosse et al. 1999] a research project is in progress to develop a testing method based on ultrasound (US) to replace the old standardized methods by providing reliable parameters for a state assessment of cementitious materials. Reasons for extended quality control are the use of high-performance concrete and the application of the so-called performance concept in design on the one hand and less workmanship on the construction site on the other hand. Further on, there is a scientific aim to understand better the process of setting and hardening of cementitious materials. Since US measurements provide an integral result a closer look to the mechanisms behind is needed for correlating the US results with other techniques. In the following the developed ultrasound (US) method is described briefly as well as the applied SEM and NMR-spectroscopy techniques along with the calorimeter measurements. This paper summarizes the first results of comparative tests. The ultrasound technique developed at the Institute of Construction Materials of the University of Stuttgart during the past ten years is evaluating the amplitude, velocity and frequency variations depending on the age of the material during the hardening process. The properties of cementitious materials are changing from a suspension to a solid during the setting process caused by the hydration of the cement paste. Parameters to be used by the evaluation are the velocity (extracted by measuring the onset time of the signals knowing the travel path of the wave), the energy (calculating the sum of the wave amplitudes) and the frequency content (using Fast-Fourier-Transform tech-niques). Other parameters are under investigation to act as sensors for the hydration process. Even though one single wave parameter could be sufficient to characterize the material, the reliability of the method can be improved by evaluating more than one. Fig 1: Set-up for the ultrasound experiments of mortar showing the mould (rubber foam and PMMA walls) and the transducers [Köble 1999]. Fig. 1 gives a sketch of the mortar container used for the ultrasound experiments. On the emitting side, the signals are produced by an US generator via the conical transducer in time intervals defined by the user. 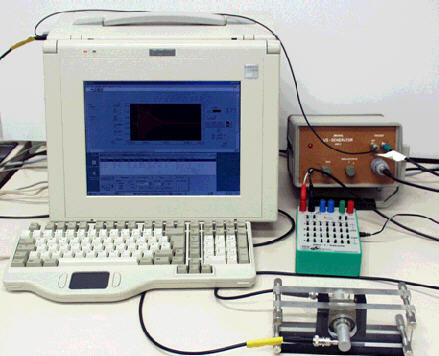 The signals measured during the setting process are recorded by a transducer and processed by an A/D-conversion device consisting of a fast A/D-transient-recorder PC-card controlled by an IBM-compatible PC. The analysis of the data is performed online using the FreshCon software developed by the Institute of Construction Materials. A more detailed description of the US method applied to the hardening and setting of cementitious materials can be found in Grosse et al. , Reinhardt et al. or Grosse & Reinhardt . The heat liberated during hydration of the mortar is one indication for the setting process. 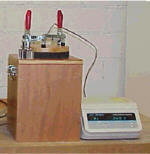 To measure it according to DIN EN 196/T9 the Langvant method was applied using a self-designed calorimeter device. The device is shown in Fig. 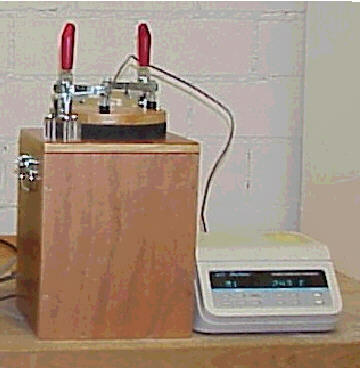 2 consisting of a Dewar container holding the probe under defined conditions. The temperature is measured through a sealed cover plate with a thermocouple placed in the middle of the probe. A more detailed description of the calorimeter measurements can be found in Köble . The temperature measurements were conducted along with the ultrasound measurements (Fig. 3), where a typical experiment consists of sampling the waveform data automatically in ten minutes intervals (for example) for 24 hours. A digital thermometer was used for temperature recording; the resulting graphs are similar to the velocity measurement, where the compressional wave velocity is plotted against the setting time (the curves are smoothed using an adjacent averaging algorithm). 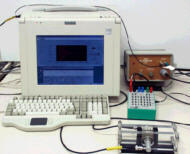 Fig 3: Set-up for the parallel measurement of ultrasound and temperature of mortar. Please refer for the mortar container to Fig. 1. Different material mixtures have been examined to see the composite influence on the velocities and temperatures. Tab. 1 summarizes all materials tested, mainly mortar with different composition (cement, w/c ratio, admixtures) was used. CEM I is a portland cement either medium rapid hardening (42.5) or rapid hardening (52.5). CEM III/B 32.5 is a blast furnace slag cement with high percentage of slag and thus a slow cement. To show some of the results Fig. 4 represents the graphs for the variation of w/c ratio and for the influence of fly ash on the data of velocity (above) and temperature (below). Regarding the velocity variation versus time for different w/c ratios (upper left graph) it is obvious that the lower the w/c ratio (dashed curve) the earlier starts the hardening process. On the other hand it could be stated that a high w/c ratio (dotted curve) results in a slow process. These data are in good agreement with those found earlier [Reinhardt & Grosse 1996]. In comparison the hydration temperature increases earlier for low w/c values compared to higher ones. The temperature curves show a similar behaviour compared to the velocity except the decrease of the temperature after its maximum around 45° C.
Fig 4: Comparison of temperature measurements using a calorimeter and US velocity (smoothed) during the setting and hardening of different mortar mixtures, different w/c ratios. Comparing the results with measurements on a mixture including 10 % pulverized fuel ash the above statement is proved to be valid: the higher the w/c ratio the slower the hardening. At last the influence of different type of cements as well as of different admixtures was investigated. Mixtures with CEM I 42.5, CEM I 52.5 and CEM III/B 32.5 with a constant w/c ratio of 0.5 were tested as well as a standard mixture of CEM I 42.5 and w/c 0.5 with air entraining agent (AEA) or pulverized fuel ash (PFA). Fig. 5 shows the results of the US and the calorimeter measurements. Fig 5: Comparison of temperature measurements using a calorimeter and US velocity (smoothed) during the setting and hardening of different mortar mixtures, cement type variation and influence of admixtures. As expected the mixture with CEM I 52.5 results in the fastest velocity increase and the highest hydration temperatures compared to CEM I 42.5 and CEM III. The results for the admixtures are not as clear due to the small influence of the air entraining agent or the PFA in the temperature curves compared to the velocity. However, the mixture with AEA results in a significantly delayed setting according to the velocity measurement. Additional tests are planned to investigate the reason for any uncertainty. The scanning electron microscopy technique is well known and should not be described in detail. For the basics please refer to the literature [Schmidt 1994 for example] and for the set-up see Köble . To be able to take micrographs with a SEM it is necessary to have dry mortar probes. A mortar paste is mixed with a thickness of 5 - 10 mm and subsequently given into an alcohol bath. Alcohol absorbs the water that the mortar needs for hydration. After 24 hours the paste is dried out at 65° C. This way it is possible to get micrographs of various stages of hydration. SEM micrographs were taken at two, five and eight hours after mixing to be comparable with the ultrasound measurements. For each hydration stage a micrograph was taken with two different optical resolutions 200:1 and 1500:1. However, a direct comparison between the two measurements is difficult due to uncertainties of the status of hydration to be considered at the same stage when the probe is given in alcohol. Therefore, the interpretation of the micrographs should be done in a qualitative way. The following figures show some significant micrographs as examples. During all experiments a densification of the structure during the first eight hours is observed as shown in Fig. 6. Fig 6: CEM I 42.5; PFA = 25 %; w/c ratio = 0.6. Fig 7: CEM I 42.5; w/c ratio = 0.55. In the first micrograph (Fig. 6) the formation of ettringite is represented by small needles. The formation of needles continues with time as shown in the second micrograph. The long needles can be addressed as crystals of calcium silicate hydrate. Two hours after mixing the cement particles appears to be separated in the structure; after eight hours they are interconnected with cement paste. A densification of the complete mixture can clearly be recognized. The needles are no longer (8 h) as dominant as compared to the beginning (2 h). Fig. 7 is showing this in more detail representing an additional snapshot after 24 hours in two different resolutions. The structure is even denser and the single cement particles are nearly transformed into gel. The picture with 1500:1 resolution on the left side of Fig. 7 shows the crystals of calcium silicate hydrate as well as crystals of calcium aluminate growing in the pores in short fibrous form. Fig. 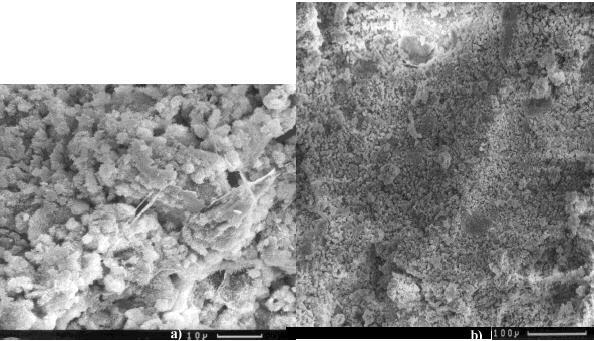 8 shows three different micrographs with examples of calcium hydroxide crystals as large hexagonal structures, which are build in the mortar paste during hardening. Fig 8: Hexagonal crystals of calcium hydroxide. Enlargement 1500:1. Fig 9: CEM I 42.5; AEA w/c ratio = 0.5. Probes after a) 2 h, b) 8 h. Enlargement 200:1. Fig 10: Mixtures with 25 % of PFA (left hand with detail) and 10 % (right hand). At last the influence of additives have been studied. Fig. 9 shows a mixture with AEA. After two hours first pores are visible (marked zone). Again, the structure is densified and in addition filled with a number of round pores. On the micrograph they are shown as half-round deepenings. In Fig. 10 two mixtures with PFA are represented. 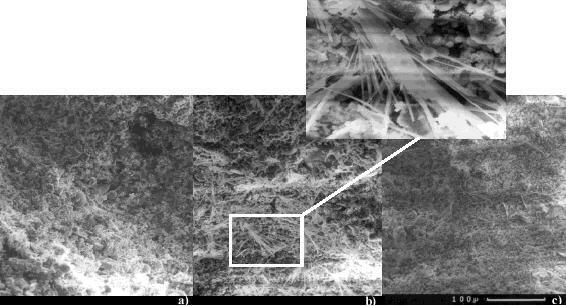 For the SEM measurements an additional paste with 25 % PFA was mixed, which was not evaluated by ultrasound measurements due to the brittle consistency. Ash particles can be recognized by their circular shape. The higher content of PFA can be observed via the higher content of ash particles (Fig. 10, left hand) compared to the mixture with 10 % (right hand). A detailed description of the basics and the application of nuclear magnetic resonance spectroscopy can be found in numerous books and papers [e. g. Herzog & Messerschmidt 1995; Abraham & Fisher 1988]. Nevertheless, some introductory remarks with respect to the method are given. The following steps can be distinguished. 1. Probe to be measured is outside the magnetic field. The momenti of the atomic nuclei are in random positions. 2. The momentum of the atomic nuclei is aligned due to their angular momentum when the probe is given into a strong magnetic field B. The stronger the applied magnetic field the lower the energy of the parallel and the higher the energy of the anti-parallel phase. 3. Stimulation: Supply of energy using a short electromagnetic wave (pulse). 4. There is a dynamic equilibrium caused by the absorption of emitted electro-magnetic energy until parallel and anti-parallel momentum is equally represented in the atomic nuclei. 5. 6. Relaxation: After turning off the pulse the old distribution of the momenti ( 2. ) is re-established while the adsorbed energy is emitted by an electro-magnetic radio wave (FID  free induction decay). The NMR spectrum of this wave is analysed with a Fourier transform using the FT-NMR method. NMR spectroscopy is a technique normally used for measurements of fluids. Due to the small dimensions of the probe holder (5 mm diameter and a length of 178 mm) it was not possible to investigate mortar. Therefore, NMR spectroscopy was applied to cement paste. Fig. 12 shows the result of three measurements with CEM I 52.5 of various w/c ratios. In the left graph the curves are plotted using a logarithmic scale. For each experiment data have been recorded automatically during 72 hours in 10 min intervals. All curves have a typical shape showing up different plateaus. The first extended plateau around two hours after mixing represents the dormant period in the process of hydration. There is another plateau around 15 hours after mixing. Kocuvan et al. indicated this plateau with the term recess, where the expansion of the hydration products is supposed to be interrupted by the interconnection of the formerly isolated particles (bridging effect). After the recess period the volume of the hydration products increases again expanding into the pore sphere. The process of hydration is nearly finished after 72 hours. Then the curve is parallel to the horizontal scale. The curves have the same shape as described in the literature (Barbic & Kocuvan 1982). However, the maximum of relaxation is observed in the data at values between 70 and 90 ms instead of 30 ms as described in the literature (Kocuvan et al. 1979). Reproducibility measurements showed small variations of these results, therefore, the explanation for this effect is difficult. It is interesting that the relaxation time at the end of the measurement corresponds to the literature. Fig 12: Comparison of different NMR spectroscopy measurements (left) and a comparison between a measurement with ultrasound and NMR spectroscopy (right) using a reversed scale for relaxation times. In comparison of NMR spectroscopy and ultrasound measurements the results of both are plotted together in the right hand graph of Fig. 12. As the NMR spectroscopy curves are usually plotted with decreasing relaxation time values, here, the relaxation time is plotted using a reversed scale to have a better chance to compare the two types of measurement. The points of inflection of each curve of the three ultrasound and NMR spectroscopy measurements are defined as a second factor of comparison. Tab. 2 shows the times t1 (ultrasound) and t2 (NMR) of the inflection points after mixture. Comparing the results of different measurements the corresponding times are in good agreement within the precision of the described experiments. Several techniques have been investigated to evaluate the hydration process in cementitious materials. The ultrasonic device presented in this article and earlier is able to extract automatically certain parameters of US waves recorded continuously during setting and hardening. The resulting curves describe the material behaviour and are related closely to the hydration process of the material. These curves are linked to the elastic properties and give a comprehensive picture of the setting process in a way that was not accessible before. Measurements of hydration temperature have some similarities to the ultrasound measurements. During the first hours of hydration these curves follow an s-shape and gives analogue information about the time-dependent setting and hardening of the material. In contrast to the described US measurements these information are limited to a certain area around the sensor. As a rule this method gives comprehensive values for small specimen only. SEM micrographs have the possibility to get a visual insight of the process of hydration. However, this method is difficult to apply to cementitious materials due to the requirements of the SEM device regarding the preparation of the small probes (evacuation or drying). This can influence the process of hydration in a way that the results of both methods (US and SEM) are not comparable anymore. Using different microscopic techniques with a SEM device operating under environmental conditions (ESEM) can solve some of these problems. Results will be reported elsewhere. The results of the experiments using NMR spectroscopy are interesting, especially in regard to the ultrasound measurements. The results of the two methods show a close correlation. It is possible to define a mathematical coherence between the curves. However, this method also need a certain time of preparation and is applicable to cement paste only (using the NMR device at our laboratory). The four described methods (ultrasound, calorimeter, SEM and NMR) are giving a new valuable insight into the process of hydration. It was proven that the ultrasonic method, developed by the authors, is an easy-to-use and flexible tool. The results of measurements on different mixtures to evaluate the setting and hardening of cementitious materials were compared to the data produced by the other methods. These methods are not as easy to handle or are not applicable to all cementitious materials as concrete for example. This report is part of an ongoing research project. Additional results as well as data recorded with modified devices (ESEM) better suitable for the materials will be published elsewhere. The presented work is the result of a co-operative research project. The authors would like to thank Alexander Herb, Dr. Bernd Weiler, Ralf Beutel and Günther Schmidt for their contributions. The help of Dr. Günter Krause and Ursel Sandebrand as well as Stefan Raitzig and Liselotte Schneider from the Otto-Graf-Institute (Forschungs- und Materialprüfungsanstalt für das Bauwesen, FMPA, at the University of Stuttgart) is gratefully acknowledged. ABRAHAM, R. J.; FISHER, J.: NMR Spectroscopy. New York: J. Wiley (1988). BARBIC, L.; KOCUVAN, I.: The determination of surface development in cement pastes by nuclear magnetic resonance. American Ceramic Society 1 (1982), no 1, pp 25-31. GROSSE, C. U., WEILER, B., HERB, A., SCHMIDT, G., HÖFLER, K.: Advances in ultrasonic testing of cementitious materials. In: "Werkstoffe und Werkstoffprüfung im Bauwesen - Festschrift zum 60. Geburtstag von Prof. Reinhardt" (Ed. Chr. Grosse), Hamburg: Libri-BOD (1999), pp 106-116. GROSSE, C. U., REINHARDT, H. W.: Ultrasound technique for quality control of cementitious materials. International Committee for Non-destructive Testing ICNDT. Proceedings of the 15 th World Conf. on NDT, Rome (2000), on CD-ROM. KOCUVAN, I.; URSIC, J.; BARBIC, G.: Nuclear Magnetic Resonance Measurements of the Influence of Some Concrete Admixtures on the Hydration of Cement. Silikattechnik, Bulletin no 30 (1979), pp 22-25. KÖBLE, S.: Physikalisch-chemischer Hintergrund des Hydratationsvorgangs von Frischmörtel im Hinblick auf Ultraschallmessungen. Diploma thesis, Institute of Construction Materials, University of Stuttgart, (1999), 84 p.
HERZOG, W.-D.; MESSERSCHMIDT, M.: NMR-Spektroskopie für Anwender. Weinheim: VCH (1995). REINHARDT, H. W., GROSSE, C. U.: Setting and hardening of concrete continuously monitored by elastic waves. Bartos, P. J. M. et al. (Ed.). Proc. of the Int. RILEM Conference "Production methods and workability of concrete", Paisley/Scotland (1996), no 32, pp 415-425. REINHARDT, H. W., GROSSE, C. U., HERB, A. T.: Kontinuierliche Ultraschal-lmessung während des Erstarrens und Erhärtens von Beton als Werkzeug des Qualitätsmanagements. Deutscher Ausschuss für Stahlbeton, Bulletin no. 490, Berlin: Beuth (1999), pp 21 - 64. SCHMIDT, P.: Praxis der Elektronenmikroskopie und Mikrobereichsanalyse. Kontakt&Studium Bd. 444, Renningen/Malmsheim: Expert-Verlag (1994).